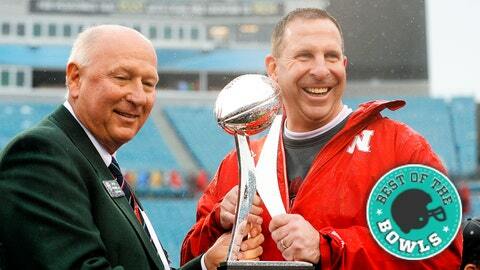 In a year full of turmoil, Bo Pelini ended it by leading Nebraska to a bowl win. First there was the 41-21 home loss to UCLA on Sept. 14. A couple days later, a tape leaked in which Nebraska coach Bo Pelini had many passionate words for Nebraska fans, and not many of them were very nice. Some started with the letter F, and strung together they sounded like some distorted Morse code. So, no, 2013 wasn’t the best of Nebraska or Pelini seasons. If the Cornhuskers were beat badly by No. 22 Georgia in the Gator Bowl, maybe that would be the last of Bo in Lincoln. Freshman quarterback Tommy Armstrong Jr., one of the primary reasons Nebraska fans can look to 2014 with some hope, connected on a 99-yard touchdown with Quincy Enunwa in the third quarter, by far the highlight of Nebraska’s 24-19 Gator Bowl win. Fake Bo Pelini, do you have any thoughts on this? Fake Bo is the best. He’s an Internet revelation, a Cornhusker football connoisseur, an American tradition. Do we need more of his wisdom? I think we do. Fake Bo, what was your offensive plan against Georgia? He stole those out of Chip Kelly’s playbook. On Georgia’s final drive of the game, down five and creeping deeper into Cornhusker territory, Fake Bo called a timeout and shared his thoughts in the defensive huddle. I don’t think things are going so well for the Nebraska defense. Meanwhile, Georgia pushed the ball into the red zone, setting up fourth-and-3 with 31 seconds remaining. How you doing, Fake Bo? … tight end Arthur Lynch drops a pass over the middle, with 10 yards of green and then the end zone in front of him. Real Bo Pelini smiles and raises his fist, as Nebraska gets its ninth win of the season, a long way from leaked tapes and daring, passive-aggressive statements and every other bit of turmoil that made Nebraska football interesting in 2013 and Fake Bo a delight. Fake Bo, how does the Taxslayer.com Gator Bowl victory feel?